Some say star kids have it easy, others say star kids have a lot more pressure on them thanks to the lineage they have to live up to. Easy or not, there’s one thing star kids get in abundance – attention. When the star kids in question are mere toddlers, neither of these things actually matter. We would say just ask Taimur Ali Khan and his cousin Inaaya Khemu, both of whom get inexhaustible amounts of attention from the paparazzi as well their fans. Yes, their very own fans. But we’re afraid Taimur (1 year, 8 months) and Inaaya (11 months) probably won’t be able to give you a coherent account of what all this attention means to them. Either way, Taimur Ali Khan and Inaaya Khemu are almost as popular as their star parents (if not more). We’re not surprised, given that the first cousins are definitely amongst the cutest and most stylish toddlers on social media. Saif Ali Khan and Kareena Kapoor’s son, Taimur Ali Khan, has had the attention of the world since even before his birth. Yes, it definitely has to do with the fact that his parents are considered to be amongst Bollywood’s finest actors – but Taimur’s popularity might have a little more to do with his full baby cheeks and adorable smile. And the fact that he’s always impeccably dressed (well done, parents). Taimur seems to be photographed everywhere he goes (with his now famous nanny). Here’s a picture of Taimur outside his play school in Mumbai. How adorable does he look in his blue t-shirt, denim shorts and red converse shoes? Taimur didn’t go to play school alone, though. Accompanying him was his younger cousin sister Inaaya. Inaaya came to play in a blush pink t-shirt, grey sweatpants and white sneakers. Accompanying her was her mom, Soha Ali Khan. Good choice of hairband, Soha. We think Inaaya will come to appreciate it too. If Taimur’s smiley picture outside his play school wasn’t enough, here’s a picture of him with his dad Saif Ali Khan. Taimur seems to be enjoying holding a badminton racket as his father lovingly looks on. Here’s another picture of Inaaya, shared by her mom Soha a few months ago when she turned nine months old. 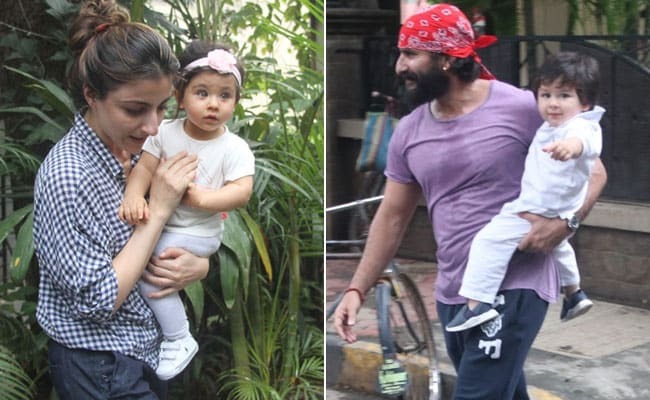 Once again, we love Inaaya’s floral hair band that perfectly matched her outfit. There you have it folks, Bollywood’s most stylish babies. Seems like their future careers are almost set.